There are 169 miles of existing neighborhood streets that are eligible for improvements over 20 years. These local streets have been selected because they have a Pavement Condition Index (PCI) of 80 or below. The PCI, a standardized rating system developed by the United States Army Corps of Engineers, is a numerical index between 0 and 100 used to indicate the general condition of the pavement. Values were assigned by a manual survey of roadway conditions, with 100 representing the best possible condition and 0 representing the worst possible. Typical conditions are rated between 40-95. 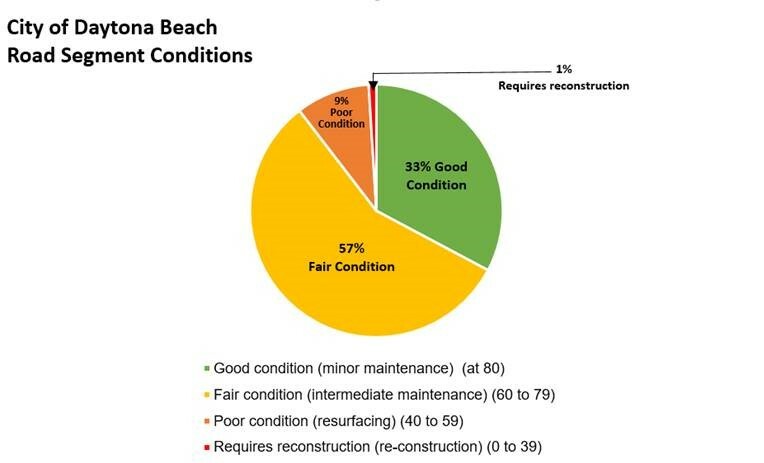 On the city’s listing of eligible projects, 1% of the roadway segments have a rating below 40, 9% have a rating of 40 to 60, 57% have a rating of 60 to 80 and 33% are rated at 80. The City of Daytona Beach will allocate $46.4 million over a 20-year period to improve the 169 miles of city streets. Improvements will include ADA compliance features and sidewalk improvements. Click to see the listing of eligible streets. The city will also consider participating in multi-jurisdictional road plans like the widening of Williamson Blvd. and LPGA Blvd.